I don’t usually blog about multiple topics in one post, but today I’ll make an exception. Wahoo! I finally finished Storybook Perfect (again). In case you were unfamiliar with why I mention the ‘again’, I had finished Storybook Perfect, the first in a trilogy, but when I compared its 175,000 word count to my estimated 120,000 word count for the following two books I didn’t like the discrepancy and decided to turn the trilogy into a quartet. You can read more here. So, finally re-written, revised, edited and formatted. Now onto fixing my paragraph and 2 page synopsis (no need to change the one sentence fortunately). Then to start submissions again. Is it sad that I’m excited by that? So that’s one thing ticked off on my NaNoWriMo prep list. 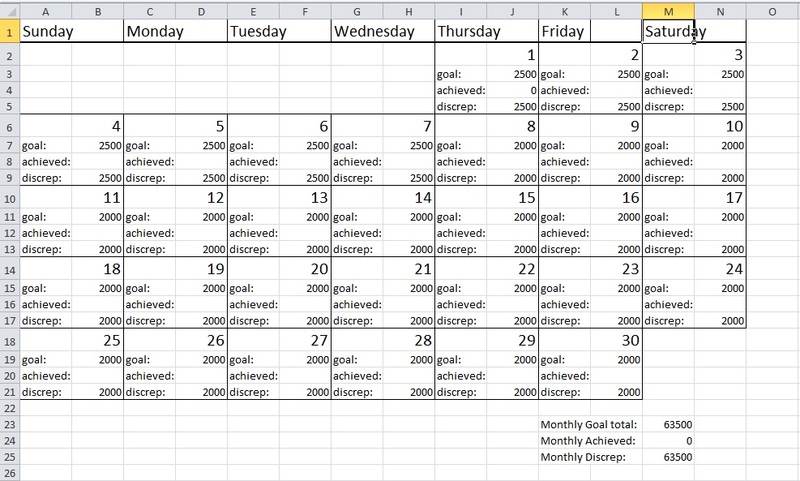 I’ve also set up a little excel spread-sheet with my word count goals. It only took me a few minutes to make the spread-sheet, though I am laughing at myself for forgetting how to make sums in Excel (a minute of thought reminded me I need to preface the word ‘SUM’ with an equals symbol). It has been three or four years since I built a spread-sheet from the ground up. Being the generous person I am (Toot toot! Hear me tooting my own horn?) I thought I’d share it for anyone who wants to save themselves the 10 or so minutes it would take them to make it. You just click this link. My parents read my post about winning the Nature’s Cuppa tea pack. They are currently doing the grey nomad thing around Australia (not sure what a grey nomad is? Here you go.) and asked me to save some of the chai tea bags for them. That reminded me I probably should try some of the other flavours (I was so in love with the chai I didn’t even open the other packs yet). My business cards arrived too. I was going to post about it yesterday, but doctor’s appointments, broken down cars (resulting in having to drive T-J to and from work), and Xander’s refusal to leave the park even after an hour and a half (I tried the good old ‘bye-bye Xander’ and walk away trick, but he just waved to me and kept on playing. You’re too young to see through mummy’s ruse yet Xander!) meant my day was a little too full for blogging. So here’s my card! I used a small strip of the website background to add a little colour, and I’ve been obsessed with the QR code for months. What do you think? Well, that wraps up my crazy multi-topic post. Do you think my word count goal spread sheet could be useful for other stuff too? 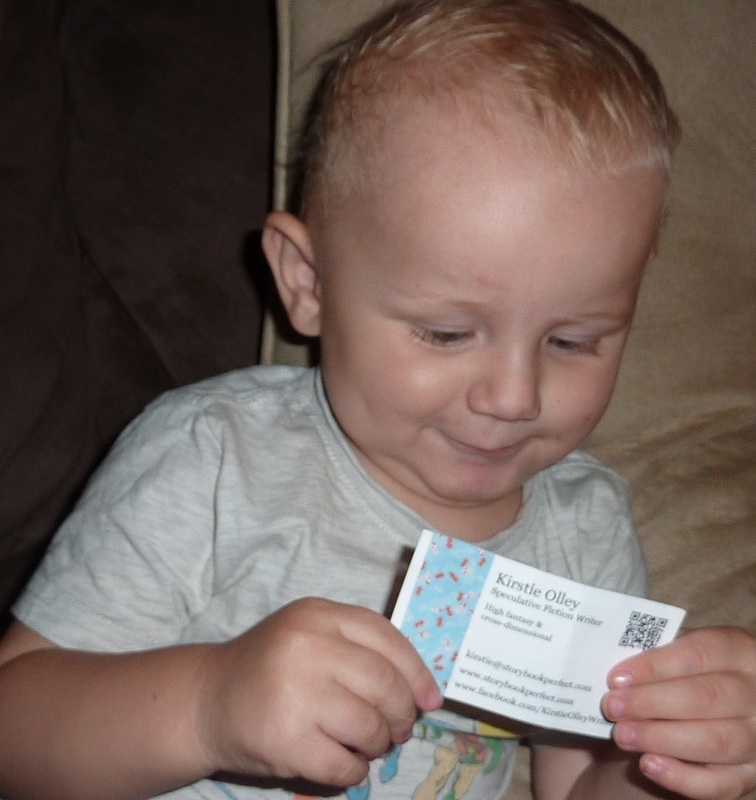 What do you think of the business card (try out the QR code!)? Keep your fingers crossed for me and the submissions please. I won the Nature’s Cuppa prize pack but am under no obligation to comment/blog about the tea. All opinions are my own and not paid for.